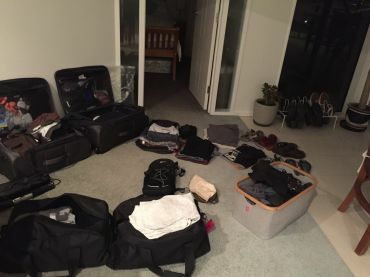 Duffers Down Under - Heaps of Clothes! Woo Hoo! We got our bags back! Just for the record, if you ever plan on losing your bags while traveling in New Zealand, just make sure you are NOT flying Jet Star... Their lost baggage department is without a doubt the most unorganized group on the entire planet. (Despite the fact that our bags are sitting beside me, they still show as "Tracing continues" on their online tracking system). Add to this incredible organizational skill the complete inability to communicate (or even listen) and you have a 100% cluster *&@#. That said, its all over. We have our bags (but JetStart probably has no clue yet), and WAY too much clothes since we had to buy more to last us the past week.